UCLA researchers have developed a lens-free, holographic microscope that can be used to detect the presence of cancer or other cell-level abnormalities with the same accuracy as larger and more expensive optical microscopes. The invention could lead to less expensive and more portable technology for performing common examinations of tissue, blood and other biomedical specimens. It may prove especially useful in remote areas and in cases where large numbers of samples need to be examined quickly. The microscope is the latest in a series of computational imaging and diagnostic devices developed in the laboratory of Dr. Aydogan Ozcan, the Chancellor’s Professor of Electrical Engineering and Bioengineering at the UCLA Henry Samueli School of Engineering and Applied Science and a Howard Hughes Medical Institute (HHMI) Professor. Dr. Ozcan’s laboratory has previously developed custom-designed smartphone attachments and apps that enable quick analysis of food samples for allergens, water samples for heavy metals and bacteria, cell counts in blood samples, and the use of Google Glass to process the results of medical diagnostic tests. The latest invention is the first lens-free microscope that can be used for high-throughput 3-D tissue imaging—an important need in the study of disease. “This is a milestone in the work we’ve been doing,” said Dr. Ozcan, who is also the Associate Director of UCLA’s California NanoSystems Institute. “This is the first time tissue samples have been imaged in 3D using a lens-free on-chip microscope.” The magnitude of this advance is indicated by the fact that this report from UCLA is featured as the cover article of the December 17, 2014 issue of Science Translational Medicine, which is published by the American Association for the Advancement of Science. Fluorescence microscopes use technology that enables them to accomplish tasks not easy to achieve with normal light microscopes, including imaging DNA molecules to detect and diagnose cancer, nervous system disorders such as Alzheimer’s disease, and drug resistance in infectious diseases. These microscopes work by labeling the samples with fluorescent molecules that are “excited” with a laser. This process gives off differently colored light that the microscope detects and uses to build images of fluorescently labeled samples, visualizing objects that are 100 to 1,000 times smaller than the diameter of human hair. These fluorescent microscopes are expensive, bulky, and relatively complicated, typically making them available only in high-tech laboratories. 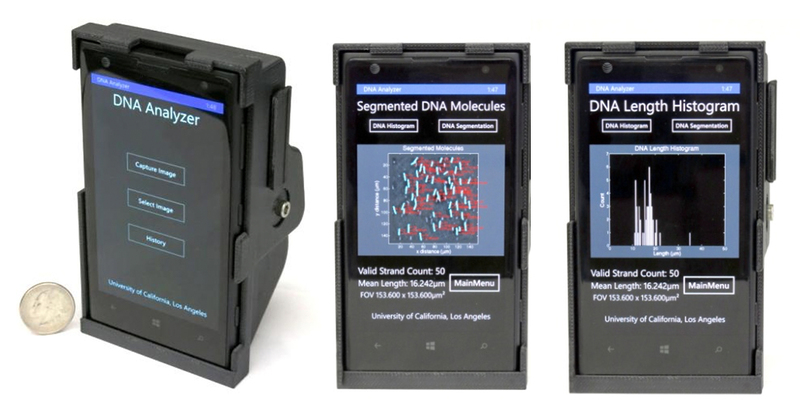 Now, researchers from UCLA’s California NanoSystems Institute have reported the first demonstration of imaging and measuring the size of individual DNA molecules using a lightweight and compact device that converts an ordinary smartphone into an advanced fluorescence microscope. 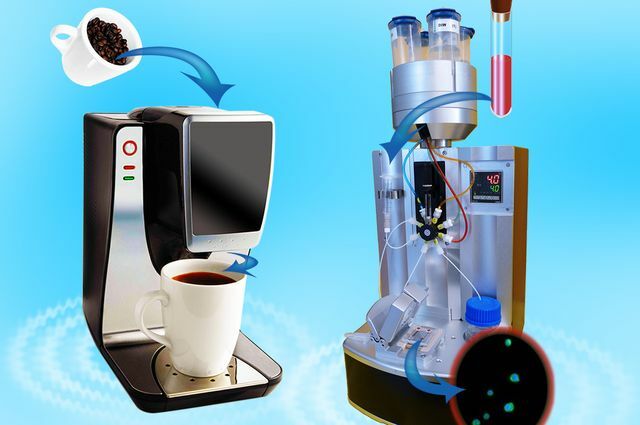 Led by Dr. Aydogan Ozcan, Associate Director of the UCLA California NanoSystems Institute and Chancellor’s Professor of Electrical Engineering and Bioengineering at the UCLA Henry Samueli School of Engineering and Applied Science, the research team published its results online on December 10, 2014 in ACS Nano. The mobile microscopy unit is an inexpensive, 3-D-printed optical device that uses the phone’s camera to visualize and measure the length of single-molecule DNA strands. The device includes an attachment that creates a high-contrast, dark-field imaging set-up using an inexpensive external lens, thin-film interference filters, a miniature dovetail stage, and a laser diode that excites the fluorescently labeled DNA molecules. Common psychiatric disorders such as schizophrenia, bipolar disorder, and major depression share genetic risk factors related to histone methylation, neuronal function, and immune function, according to new findings by a large collaborative research project from the Psychiatric Genomics Consortium (PGP) involving UCLA, King’s College London, Cardiff University in Wales, Harvard, and MIT. Thousands of genetic differences in the human genome act together to increase the risk for psychiatric conditions such as schizophrenia. However, until now, it has not been clear how these genetic changes affect biological processes that then go on to alter brain function. In this study, the group analyzed genetic data from more than 60,000 participants, including individuals with schizophrenia, bipolar disorder, major depression, autism spectrum disorders (ASDs), and attention deficit hyperactivity disorder (ADHD), as well as healthy individuals. The aim was to identify which biological and biochemical pathways caused risk for these disorders. By grouping the genetic data together, the consortium found that genes relating to histone methylation (the strongest association), neuronal, and immune function pathways are are risk factors associated with the development of all the disorders. Such biological pathways are important, they noted, because they are much broader drug targets than are single genes or proteins. “We took the hundreds of genes in the biological pathways identified by our collaborators and modeled them as a gene network,” said Dr. Daniel Geschwind (phot), a UCLA Professor of Neurology, Psychiatry, and Genetics, and a study author. This approach allowed the researchers to explore the role of these pathways during brain development and aging. Dr. When we think of how we fight disease, the image of cells in our immune system fending off microbial invaders often comes to mind. Another strategy our bodies can employ is to cut off the enemy’s supply lines and effectively starve disease-causing microbes of the iron they need to function. However, this tactic can backfire and cause anemia if the iron-starved state is sustained for too long, a common problem in chronically ill patients. The search for therapies against this anemia of chronic disease (ACD) could take on new directions thanks to a recent study published online on February 6, 2015 in Blood. In it, scientists in the Molecular Medicine Partnership Unit, a joint venture of the European Molecular Biology Laboratory (EMBL) and the Heidelberg University Clinic, both in Heidelberg, Germany, have found a hitherto unknown way through which mice starve pathogens of iron. Mammals keep iron out of reach of invading microbes by storing it in cells like macrophages--white blood cells which, among other things, normally “recycle” the iron from red blood cells back into the bloodstream. When the body is under attack, macrophages respond by decreasing levels of their iron-exporter, ferroportin, thereby sequestering the iron. Scientists knew that this decrease in ferroportin could be achieved by increasing levels of hepcidin, a hormone which regulates iron levels. But Claudia Guida, a Ph.D. student in the group jointly led by Dr. Matthias Hentze at EMBL and Dr. Martina Muckenthaler at Heidelberg University Clinic, found that ferroportin can be dialed down independently of hepcidin, by triggering responses from TLR2 and TLR6, two molecules our immune system uses to detect bacterial components. 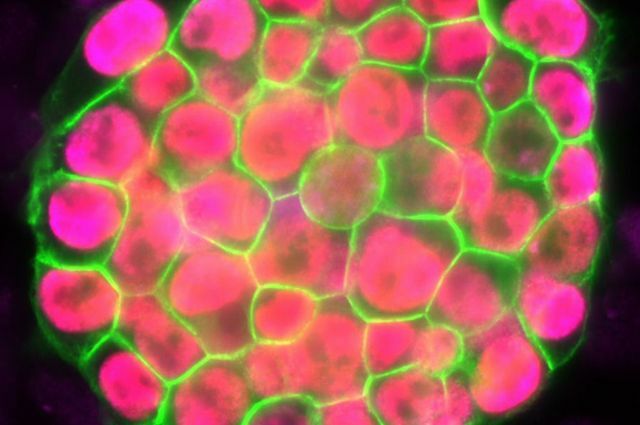 In a study that provides scientists with a critical new understanding of stem cell development and its role in disease, UCLA researchers led by Dr. Kathrin Plath, have established a first-of-its-kind methodology that defines the stages by which specialized cells are reprogrammed into stem cells resembling those found in embryos. The study, conducted by researchers at the Eli and Edythe Broad Center of Regenerative Medicine and Stem Cell Research, was published online on December 18, 2014 in Cell. Induced pluripotent stem cells, known as iPSCs, are cells that can be generated from adult cells and then, like embryonic stem cells, be directed to become any cell in the human body. Adult cells can also be reprogrammed in the lab to change from a specialized cell back to an iPSC (and thus becoming a cell similar to that of an embryonic stem cell). The study centered on an examination of the process of X-inactivation. Reprogramming takes one to two weeks and is a largely inefficient process, with typically less than one percent of the starting cells successfully becoming an iPSC. The exact stages a cell goes through during the reprogramming process are not well understood. This knowledge is important, as iPSCs hold great promise in the field of regenerative medicine, as they can reproduce indefinitely and provide a single source of patient-specific cells to replace those lost to injury or disease. They can also be used to create novel disease models from which new drugs and therapies can be developed. An international group led by scientists at UCLA’s California NanoSystems Institute has developed a new method for effectively extracting and analyzing cancer cells circulating in patients’ blood. Circulating tumor cells are cancer cells that break away from tumors and travel in the blood, looking for places in the body to start growing new tumors called metastases. Capturing these rare cells would allow doctors to detect and analyze the cancer so they could tailor treatment for individual patients. In his laboratory at the UCLA California NanoSystems Institute, Dr. Hsian-Rong Tseng, a Professor of Molecular and Medical Pharmacology, used a device he invented to capture circulating tumor cells from blood samples. The device, called the NanoVelcro Chip, is a postage-stamp–sized chip with nanowires that are 1,000 times thinner than a human hair and are coated with antibodies that recognize circulating tumor cells. When 2 milliliters of blood are run through the chip, the tumor cells stick to the nanowires like Velcro. Capturing the tumor cells was just part of the battle, though. To analyze them, Dr. Tseng’s team needed to be able to separate the cells from the chip without damaging them. In earlier experiments with NanoVelcro, the scientists used a technique called laser capture microdissection that was effective in removing individual cells from the chip without damaging them, but the method was time-consuming and labor-intensive, and it required highly specialized equipment. Now, Dr. Tseng and his colleagues have developed a thermo-responsive NanoVelcro purification system that enables them to raise and lower the temperature of the blood sample to capture (at 37 degrees Celsius) and release (at 4 degrees Celsius) circulating tumor cells at their optimal purity. The U.S. Food and Drug Administration (FDA) today approved a new drug to treat patients with advanced breast cancer, signaling a new strategy for arresting tumor growth and extending the time before cancer worsens in women with metastatic disease. The drug, Ibrance (palbociclib), was studied in 165 post-menopausal women with advanced estrogen–receptor positive (ER+) and HER2–negative (HER2-) breast cancer who had received no prior systemic therapy for their metastatic disease. In 2013, after patients in a clinical study led by UCLA researchers showed a dramatic improvement, the FDA granted the drug “breakthrough therapy” status, allowing it to be fast-tracked for approval. ER+/HER2- is the most common type of breast cancer; it is traditionally treated with therapies like tamoxifen or letrozole that target the hormone receptor pathway. “Ibrance is the first drug in its class to be approved by the FDA,” said Dr. Richard Finn, the study’s principal investigator and a researcher at UCLA’s Jonsson Comprehensive Cancer Center. “All of us at UCLA are very proud of the important role we played in bringing this new agent to patients.” Developed by Pfizer, Ibrance targets proteins in cancer cells — cyclin D kinase 4 (CDK 4) and cyclin D kinase 6 (CDK 6) — preventing the cells from dividing. A multiyear phase 2 study found a significantly higher progression-free survival rate for patients with advanced ER+/HER2- breast cancer who were given palbociclib in addition to letrozole, a standard anti-estrogen treatment, compared with women who received letrozole alone. Since 1970, life expectancy around the world has risen dramatically, with people living more than 10 years longer. That’s the good news. The bad news is that starting when people are in their mid-to-late-20s, the brain begins to wither — its volume and weight begin to decrease. As this occurs, the brain can begin to lose some of its functional abilities. So although people might be living longer, the years they gain often come with increased risks for mental illness and neurodegenerative disease. Fortunately, a new study shows that meditation could be one way to minimize those risks. Building on their earlier work that suggested people who meditate have less age-related atrophy in the brain’s white matter, a new study by UCLA researchers, together with a colleague from the Australian National University, found that meditation appeared to help preserve the brain’s gray matter, the tissue that contains neurons. The scientists looked specifically at the association between age and gray matter. They compared 50 people who had mediated for years and 50 who hadn’t. People in both groups showed a loss of gray matter as they aged. But the researchers found that, among those who meditated, the volume of gray matter did not decline as much as it did among those who didn’t. The article describing these new results was published online on January 21, 2015 in Frontiers in Psychology. Dr. Florian Kurth, a co-author of the study and a postdoctoral fellow in the UCLA Brain Mapping Center, said the researchers were surprised by the magnitude of the difference. “We expected rather small and distinct effects located in some of the regions that had previously been associated with meditating,” he said. An international team of scientists has discovered the greatest absence of evolution ever reported — a type of deep-sea microorganism that appears not to have evolved over more than 2 billion years. But the researchers say that the organisms’ lack of evolution actually supports Charles Darwin’s theory of evolution. The findings were published online on February 2, 2015 in PNAS. The scientists examined sulfur bacteria, microorganisms that are too small to see with the unaided eye, that are 1.8 billion years old and were preserved in rocks from Western Australia’s coastal waters. Using cutting-edge technology, they found that the bacteria look the same as bacteria of the same region from 2.3 billion years ago — and that both sets of ancient bacteria are indistinguishable from modern sulfur bacteria found in mud off of the coast of Chile. 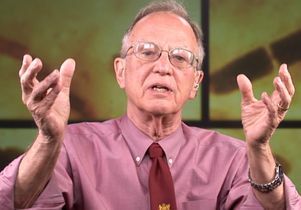 “It seems astounding that life has not evolved for more than 2 billion years — nearly half the history of the Earth,” said Dr. J. William Schopf (photo), a UCLA Professor of Earth, Planetary, and Space Sciences in the UCLA College, who was the study’s lead author. “Given that evolution is a fact, this lack of evolution needs to be explained.” Charles Darwin’s writings on evolution focused much more on species that had changed over time than on those that hadn’t. So how do scientists explain a species living for so long without evolving? 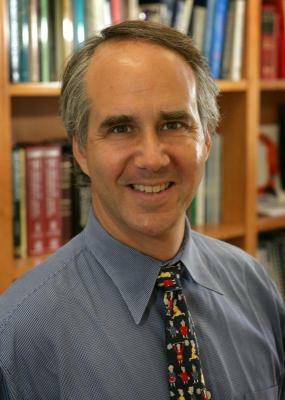 “The rule of biology is not to evolve unless the physical or biological environment changes, which is consistent with Darwin,” said Dr. Schopf, who is also Director of UCLA’s Center for the Study of Evolution and the Origin of Life. The environment in which these microorganisms live has remained essentially unchanged for 3 billion years, he said.